If you are a serious woodworker who builds large projects or is into large-scale production, a full-size router like Porter Cable’s Speedmatic 5-Speed Plunge Router is one of the best investments you can ever make. This is simply because they can do everything smaller routers with fixed bases can, plus a lot more. In case you are already thinking about getting yourself one of these bad boys, you may want to take a look at this short guide. You will learn more about the Speedmatic plunge router and what it can do for your shop. It has a high-performance, soft start motor with EFC. The adjustable speed and depth stop turret allow for flexibility. The auto-releasing collet adds convenience. It has no spindle lock, which comes as a standard feature on many routers today. Why Go For a Full-Size Plunge Router? We went through a phase where we must have owned about three routers of different bases and sizes. We specifically used the fixed-base router for edge profiling and similar tasks and used the plunge-base ones for routing strictly in the middle of the wood. One of the routers was a compact one while the rest were mid-size routers, all of which we used with smaller bits. However, we stayed away from full-sized routers because we found them intimidating. Needless to say, we soon realized our shop had more equipment than necessary. 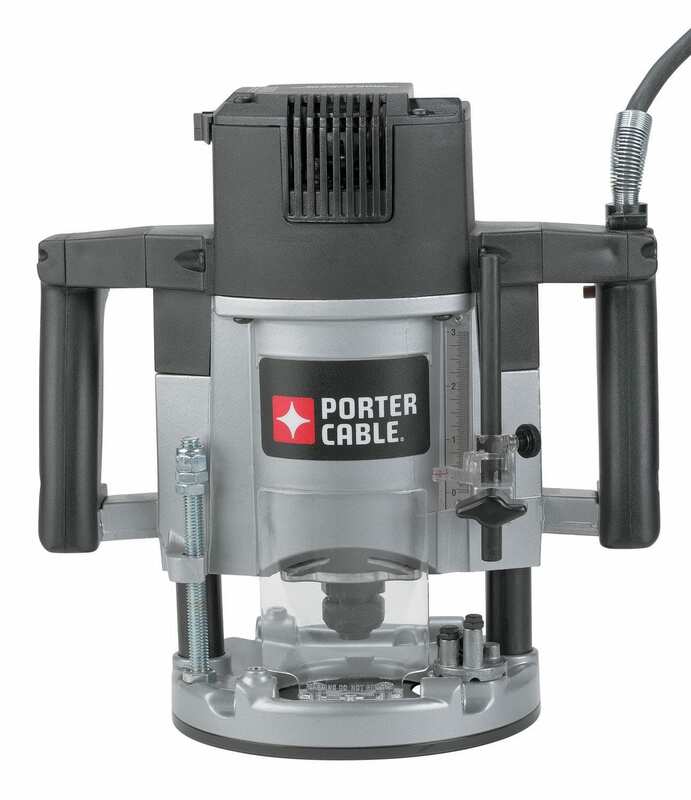 Eventually, we mustered the courage to buy a full-size router, the Porter Cable Speedmatic 5-Speed Plunge Router. It is formidably large and heavy but packs a lot of power. A full-size plunge router like the Speedmatic is for dedicated woodworkers who need a tool that is powerful and versatile enough to accomplish all kinds of projects. Being a plunge-base, this router can accomplish everything that a fixed-base router can, plus more. Also, since it is a full-size router with several speed settings, it can work safely with any bit size. When we finally had the Speedmatic 5-Speed Plunge Router set up on our table, it was refreshing to be able to use just one router for all our projects. This tool does not just save us time. It does the job amazingly well. It is the ultimate workhorse. The highly powerful motors of full-size routers enable them to take on even the toughest applications with ease. If you try to do that with a smaller router with a lower horsepower, you will likely end up shortening the life of the router. In addition, since a full-size router can take ½-in shank bits, that means it can double as a shaper. You can even use it as a fixed-base router by simply adjusting the depth lock if the work calls for it. Needless to say, a full-size plunge router can do everything. You need a plunge router to make nice joints and stopped grooves and flutes. Some jigs used to create dovetails, mortises, and others will not work as well without a plunge router. Same goes for some specialized bits. Meanwhile, while you can mill stopped grooves using a fixed-base router, a plunge router is the simpler and cleaner option. If you use a fixed-base, you will have to tip the router to the side or wait for it to spin down before taking it out towards the end of the cut, creating burn marks. Using a plunge router, you only plunge it to your preferred depth, lock the lever while cutting, and release it after the cut. Plunge routers are more easily adjusted. Plunge-base routers have fine depth adjustment settings that allow for better and easier fine-tuning. You often can’t say the same thing about fixed-base routers. In fact, one of the challenges of using them is making small adjustments to the depth. The Speedmatic 5-Speed Plunge Router is one heavyweight, measuring 14.8 x 14.8 x 11 in and weighing 17.2 lbs. There is a very good reason behind this massive body. This router has a 15-amp, 3.25-hp motor that can handle even the most difficult operations. With a soft start feature, it lets you ease into each cut and prevents the router from jerking away from your hand despite having such a powerful motor. This plunge-base router has five preset speeds to match any shank bit size, letting you cut well and safely. Finally, it has a multi-position depth stop turret that makes the tool rather flexible and an auto-release collet that makes bit removals and changes simpler and faster. The 15-amp, 3.25-hp motor on this plunge router is just the right kind of power you need for even the toughest routing operations on a daily basis. It can cut a lot out of any material you feed it, leading to smooth cuts even on the hardest woods. A motor such as this one can cut quickly and without breaking down. This is why this is the preferred router type for production work. A motor such as the Speedmatic plunge router’s would be dangerous to work with without soft start technology. Normally, when you turn on your router, it will blast to the preset speed right away. This may cause the router to jerk, leading to uneven cuts and risk of injury. With soft start, the motor will gradually work its way up to the preset speed, eliminating any sudden movement on the router’s part and any shock on yours. EFC, on the other hand, stands for electronic feedback circuitry. It is a feature that allows your router to monitor its load constantly and adjust to it automatically. This means your router will cut at the same speed no matter the load. The Speedmatic plunge router has five preset speeds of 10,000, 13,000, 16,000, 19,000, and 21,000 rpm. The lowest speed setting of 10,000 rpm is a safe speed for large bits measuring 2.5 in to 3.5 in while the highest speed setting of 21,000 rpm is perfectly fine for even 1-in bits. By being able to use the right router speed to match your bit and your wood, you can avoid ending up with those unsightly burn marks. Having a multi-position depth stop turret means you have the flexibility of making repeated plunge cuts without having to measure each time you plunge. This is a neat feature that makes routing just a little less stressful. You know how sometimes, bits can get stuck or “frozen” on the collet and you have a hard time removing them? The self-release feature takes care of that for you by making the collet and the collet nut come out as a single unit. We believed that the only thing scarier than spending more to get a full-size router is spending more on the wrong router. This is why we pored over customer reviews of the Speedmatic 5-Speed Plunge Router. Fortunately, most of the reviews were positive so we ended up buying it. Most of the good feedback were about the plunge router’s impressive performance that never fails to deliver even with the toughest cuts on the toughest wood. One of the repeat complaints is about the router’s size and weight, and how it is impractical to use it for lighter work. But then again, those are what make a full-size router. Although a full-size router can do light work too, it can’t be a full-size router if it’s not heavy or if it can be held in one hand. The other complaint is about how the plunge lever lock has to be held down the entire time the height is being adjusted, but another user found a way around it by removing the spring from the adjustment handle. All in all, it appears that the Speedmatic 5-Speed Plunge Router won the hearts of many woodworkers. Even those who had a few complaints about it still gave it good ratings and said they were amazed at what it could do. This plunge-base router from renowned manufacturer Bosch has a 3.75-in base opening that allows it to work on just about any task. Where the Speedmatic 5-Speed Plunge Router has an adjustable turret, Bosch boasts of an even better system that guarantees effortless depth adjustments. The soft start motor with EFC has a fully variable speed range of 8,000 to 21,000 rpm. There is also an added feature on the plunge mechanism for smooth and precise cuts. Finally, it has a spindle lock, which is something the Speedmatic plunge router does not have. Other neat features include a lock-on trigger switch, a built-in fan, a chip deflector, an extended depth control knob for under-the-table routing operations, and double insulation technology. Like Porter Cable’s Speedmatic plunge-base router, Makita’s RP2301FC has a variable speed soft start motor with EFC. it has an electric brake that aims to increase productivity. However, unlike the Speedmatic plunge router, this one has a slightly wider speed range, running between 9,000 to 22,000 rpm. The depth range is 2.75 in, just a little bit shy of the Speedmatic’s 3-in plunge range. Hitachi’s plunge router has a soft start motor with an electronic variable speed dial, which is located on the handle to give the operator better speed control. Its lowest speed setting is 8,000 rpm, which is ideal for the biggest bits. Its other features include a fine plunge depth adjustment knob, a unique collet chuck design, a dust guide, and elastomer-coated handles that provide better grip and reduces vibration. Although the DeWalt plunge router’s horsepower is a little less than that of the Speedmatic plunge router, it does have a slightly wider variable speed range of 8,000 to 22,000 rpm. The router makes use of a rack and pinion mechanism to adjust for plunge depth. It measures 5 ⅝ x 6 11/16 in and weighs 11.2 lbs. It comes with a micro-fine bit depth adjuster and magnified scale for better visibility. There will always come a time when our woodworking projects simply can’t be handled by trim routers or mid-size routers with fixed bases anymore. When that situation comes, you need to have a powerful router like the Porter Cable 7539 Speedmatic 5-Speed Plunge Router. Its high-performance motor can take on even the hardest woods and make even the toughest cuts without compromising quality and safety. It also has five speed settings that permit the use of various bit sizes and a self-releasing collet that make bit removal easy.